Public institutions are often criticized as being bureaucratic, inefficient, or ineffective at fulfilling the purposes they are designed to do, compared with private, user-centric, industries. Often in the case of public institutions, individuals have no opportunity to choose a better product, as is the case in the private sector. 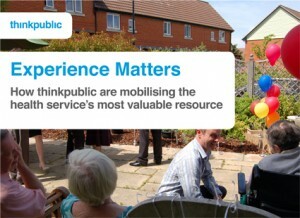 That therefore leaves little incentive to innovate the design of public services. However initiatives are not absent. ThinkPublic, a social design agency, has worked with hospitals in the UK to redesign the National Health Service to become a more patient-centered public service. Their experience based design methodology involves individuals’ experiences, existing and aspirational, in the design process. Interviews, videos, photographs, journals, and web blogs of patients, carers, and hospital staff have all been used to design new, patient-centered, solutions for several difficult areas of health care, while simultaneously encouraging patients, carers, and staff to work together to address problems.